A group of MPs from different political parties, called the The All-Party Parliamentary Group, wants Facebook, Twitter and other big technology companies to fund research into the impact of social media on the mental health of young people. The group have released a new report looking at the impact of social media on mental health, which says more needs to be done to tackle upsetting online content and protect children. The MPs want Facebook, Twitter and Instagram to follow a code of conduct (a set of rules) and be regulated by Ofcom - the organisation that keeps a check on how services like the internet, TV and radio are run. 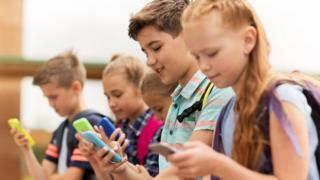 Are social media companies doing enough to protect children? I truly think our report is the wake-up call needed to ensure - finally - that meaningful action is taken to lessen the negative impact social media is having on young people's mental health. The group of MPs wants the government to publish advice for young people about time spent online. They also want research to be carried out into whether addiction to social media should potentially be classed as a disease. The World Health Organisation (WHO) already lists gaming disorder - such as addiction to video games - as a disease. The MPs are calling for social media companies to follow a set of rules, which would focus on tackling potential harms to young people - such as eating disorders, low self-esteem, lack of sleep and overdependence on social media. Social media has the potential to positively impact young people's lives, but the report also looked at how the negative effects can isolate young people from accessing "real world" professional help, exposing them to online bullying, and affecting self-esteem and body image. The government will soon publish the set of responsibilities for online platforms, how these responsibilities should be met and what would happen if they are not. If you are at all worried about social media or any of the issues that you've read in this article, there are lots of places that you can go for support. You can speak to an adult that you trust like a relative or a teacher. BBC's Own It have an article on how to deal with social media anxiety and who you can speak to if you're worried you might need help. Is that meme really an ad?